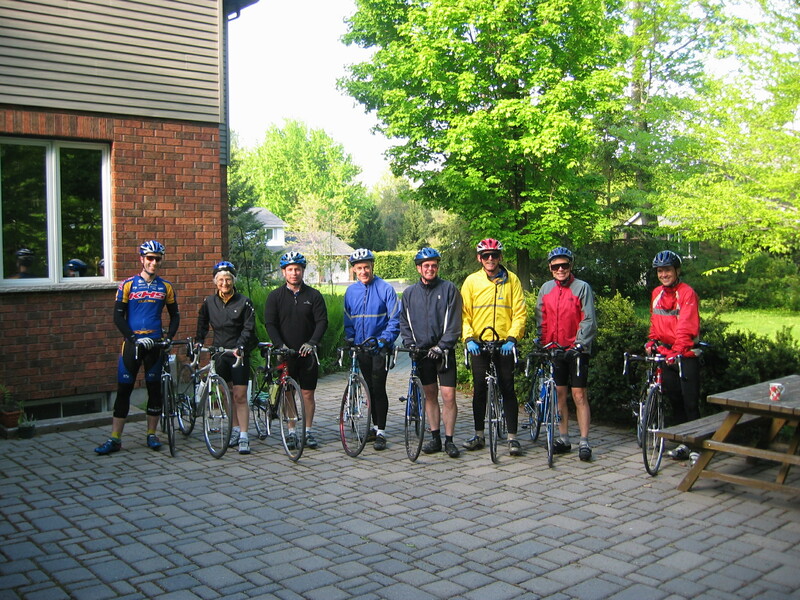 Arnprior Cycling | Two Minutes … . Hello, don’t despair the dry roads and warm temperatures are just around the corner. Okay, who am I kidding? We’re still in a deep freeze and there’s more snow than ever. But, the end is in sight, if the dry roads and warm temperatures aren’t. Yes, we live in hope – “Youth is easily deceived because it is quick to hope.” So, will we be on the bicycles soon? I didn’t say thank you to the Fitzroy skate-ski groomer. I didn’t say thank you for the ride to the ski park. I didn’t say thank you for sharing time with me to-day – that was fun. I didn’t say thank you to the barista – that was a great cup of coffee. I didn’t say thank you for dinner – that was delicious. I didn’t say thank you for participating in the group weekend rides. I didn’t say thank you for the compliment – that was nice of you to say that. I didn’t say thank you for your patience – I’m sorry I’m late. I didn’t say thank you for helping me understand how that’s done. I didn’t say thank you for your frankness and friendship. I didn’t say thank you for bringing that to my attention – I’ll try to do better. I didn’t say thank you to my parents. Yes, I didn’t say thank you enough. To be – is to be alive and that is the beginning of everything. Regarding future blog posts, the next one will be in May 06 or thereabouts. Regarding the Manifesto (Rules of the Road), it’s on ice indefinitely but I do have a replacement – a simple, sensible statement for publication in a few days. Also available on https://www.instagram.com but you’ll have to request to follow. I won’t follow back so your privacy is assured. Hello, and merry x-mas to you all. Don’t you just love this time of year – the nostalgia for childhood that it elicits, the parties, the x-mas cheer, the raising of glasses – and the relaxed, easy-going manner of most folk, the genial smiles, the close embraces, and the firm handshakes, and the genuine gaiety that abounds. In fact, I was saying to an acquaintance a day or so ago that if x-mas didn’t exist we’d have to make it up. It’s just such a welcome interruption to everyday life, coming when it does in late December in this dark, cold, snowy land. And, then, I reminded myself that it is made up. But, what a fabulous story, even if it’s genesis is an elaborate concoction of Roman and Hellenistic and Jewish cultures and traditions. Fortunately, the purported virgin nativity phenomenon has not yet hijacked the joy and bonhomie of this secular occasion and is no impediment to commercial enterprise and family reunions and the excitement and anticipation of young children, and the feeling we have of belonging to a greater community – as neighbours, and total strangers alike, greet each other on the street, at the LCBO and in the grocery shops, and myriad disparate places with jovial salutations of Happy Holidays, Merry X-mas, Joyeux Noel, and Happy New Year. It’s amazing and wonderful. All, just because it’s a lovely pagan mid winter festival. Perhaps, good cheer is at work, too. That’s my two-cents worth anyway. Ask yourself, where else would you rather be on December 25 than adding to your fatty bits by sitting down to a welcome feast with good friends and close family? Regarding the Manifesto (Rules of the Road), it’s on ice for now for lack of interest and participation. Dear Mr Einstein: Why are we alive? I forgot to mention this yesterday. It’s just an idea I have to bridge the period between when we stop riding because of cold weather and when we take up winter activities such as skiing and riding on trainers. It makes sense to be outside as much as possible and not indoors on Zwift or on a spinner or rollers. What do you think? Okay, so here’s the plan, assuming the weekend weather is inclement for cycling. What about getting together in our running gear on Saturday/Sunday mornings at Sweet and Sassy at 8 am. We’ll run 5-10 kilometres at an easy pace on the Centennial Trail to Robert Simpson Park then to the Grove and around (the long way) to the high school track where we’ll do some laps and some intervals; from there, we’ll reverse directions and run/jog back to S&S for coffee. This is a tentative route only and it will evolve as we get run-fit. I expect the run time to be an hour or so or longer. TBD. In any event, something to think about. It definitely will be warmer than cycling. If you’re interested, email arnpriorcycling@bell.net. If not, then, no problem; it’s just an idea. Always searching for the next big thing. Ask yourself, where else would you rather be when the alarm rings on a weekend morning than in your track suit and running shoes jogging away the fatty bits? You know you’ll just want to be there. Did you rollover in bed this morning and pull the pillow over your head to drown the roar of the wind? Did you jump out of bed with a bounce in your step and a song in your heart at the prospect of a new day. How many indistinguishable moments in a lifetime? How many in a year, each slipping away unnoticed, unmarked, and unfulfilled? A long life is a short life – even Methuselah is dead. What does one, anyone, remember of lying in bed. It’s getting up and confronting the day that creates memories. We had such a day. It’s rare for a bicycle ride to disappoint. Pedalling is elemental, a simple pleasure reaching back into childhood, and freedom – before books and consequences. Still, some rides are difficult, arduous even; and, are enjoyed in remembrance more than in actuality. 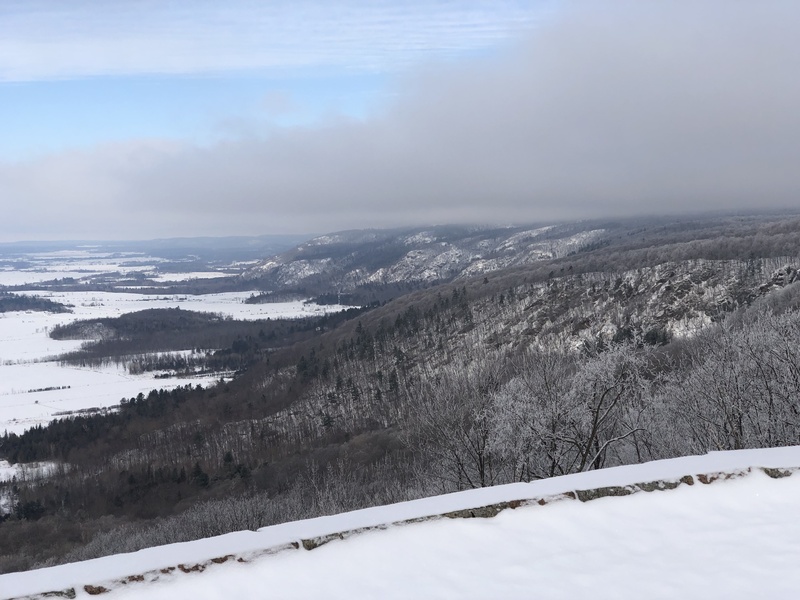 To-day’s answer to “How was the ride?” was that this Blog is BS when it extols the virtues of cycling and understates the effort, written as it is in the warmth and comfort of a den and far removed from the real cold and wind and climbs and treacherous roads encountered. The reality, we worked hard into a heavy cross-head wind for much of the ride and had to negotiate tricky patches of ice and snow especially on Goshen. Our fingers and toes were tingling from the cold; the mind tingling with anticipation and the heart warm with the coursing blood of life. The effort paid dividends, however, when we turned at Burnstown for White Lake and then SW for Arnprior. It doesn’t get better than this. Okay, fair enough, it was fun, I think. But thinking is insufficient to the experience. It’s the feeling that I recall/remember. And, that was great. Nothing quite like the afterglow of a hard effort, cheeks ablaze, hands cupped around a hot mug of coffee, apres ride chatter and banter filling the air. Ah, delicious memories to feast on down through the years. All said, you guessed it; there will be no ride on Sunday. Ask yourself, where else would you rather be when the alarm rings on a weekend morning than on your bicycle pedalling away the fatty bits? You know you’ll just want to be there. Hello. I’m writing this from the comfort of the Mamie Clafoutis Wesboro Boulangerie – a very nice place. I’m sipping a hot americano and munching a pumpkin muffin. I’m thinking of the morrow. My bicycle is in the capable hands of Alistair at Cyclelogik. I await his welcoming text telling me all is well. Alas, all is not well. I just heard what I didn’t want to hear; and while I love Campagnolo, not today. So, no bike but no issues, as in N+1. As the Scout’s say, Be Prepared. Smile, breathe, and go slowly. Snow is falling and the wind has kicked up. It’s definitely not cycling weather. But, we are nothing if not intrepid wanderers impatient for our next cycling fix. And, like a battery with only one terminal attached, we don’t spark until connected with two feet to our alfresco passion. These are now the days of dwindling light, gloominess, and cold. It’s not easy to saddle-up these mornings but it’s worth the effort. ‘Trust me’ just like Richard Nixon said. You won’t be disappointed. Plug yourself into the moment. You’ll be alive and alert, and happy. Sweet & Sassy Sweet & Sassy 8:00 am 8:00 am – (two minute rule in force) Ride to Burnstown via RR and L-W and Goshen; home via McLeod, McLaughlin, W-L for a total distance of 64 kms/476 metres. No coffee until back at S&S. Weather as of now, full sunshine from 7 am to 10 am; winds SW 30+; Temperature +1. Dress accordingly. Hope to see you there. NB: Check for an updated blog post by 6:30 am in the event of cancellation of the ride. Yes, you read that correctly. The date says November 04. What’s with that? Awesome, really, once we saddled-up and got moving down Russet and felt the full rays of the sun on our backs. Every kilometre brought us closer to pleasure and before long we experienced the pure, simple joy of riding (again) with like-minded friends. Yes, it was cool but only marginally. By the time we reached the Crevier, we had to stop to shed outer layers. Faces aglow and spirits high we carried on, knowing the pace and climbs would keep us warm. It was perfect. Well, it would have been perfect if I were twenty years younger, had fresh legs, and a stout heart. Still, I had good companions looking after me and we made a merry (small) group of cohesive cyclists. It was great, especially given the time of year – a day stolen, you might say; a gift from November to remind us that even the bleakest month has its delicious fruits. You know, you just should have been there. 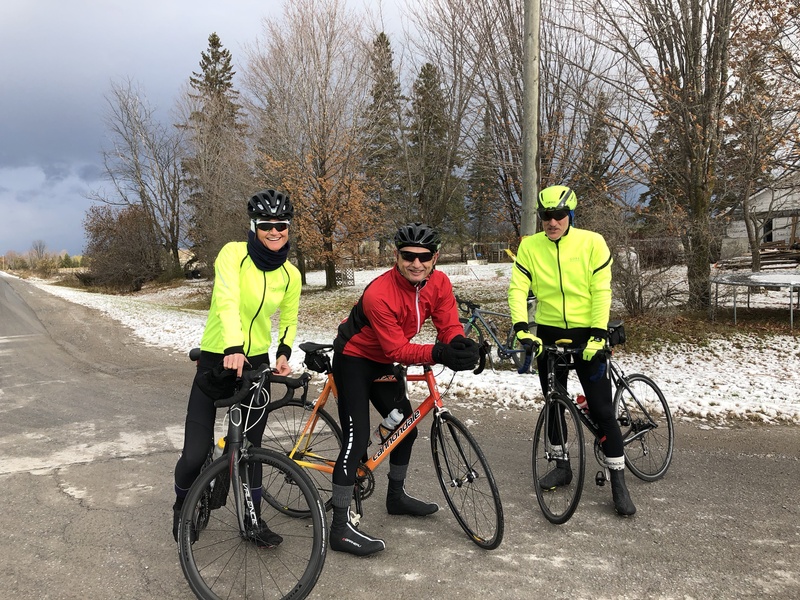 Kudos to Joe, who is all-go all the time – strong, fit, powerful; and thanks to Steve for driving down from Pembroke and whose steady wheel is always a delight to follow; and, to Cathy, too. Words don’t capture her tenacity, amazing drive, wattage, and radiance. Okay, next weekend is looking favourable for riding. Stay tuned for updates later in the week. Ask yourself, where else would you rather be when the alarm rings on weekend mornings than on your bicycle pedalling away the fatty bits? Hey, X-mas is coming and food will be plentiful and resolve inadequate for the occasion. Hello. Where have you been? Or, is that your question. Does it matter? No. What matters is that we go forward and not backwards. The RLCT is scheduled for June 08/09. If it’s not already on your calendar, pencil it in now. We’ll begin our official training programme on May 04/05. This gives us 10 weekend training days before the event itself. That’s not enough so we’ll hit the road running with 100+ kilometre rides right from the get-go. We’ll also include a couple of trips to the Gatineau to toughen the legs. Let’s hope April is warm and dry. It’s likely to be wet and cool, making group rides a hit and miss affair. Regardless come May, it’s pedal to the metal. You might say this advance notice is too early. Perhaps. But, I also invite you to consider skate skiing to maintain and improve your cardio fitness. That way you’ll arrive in April fitter than ever. 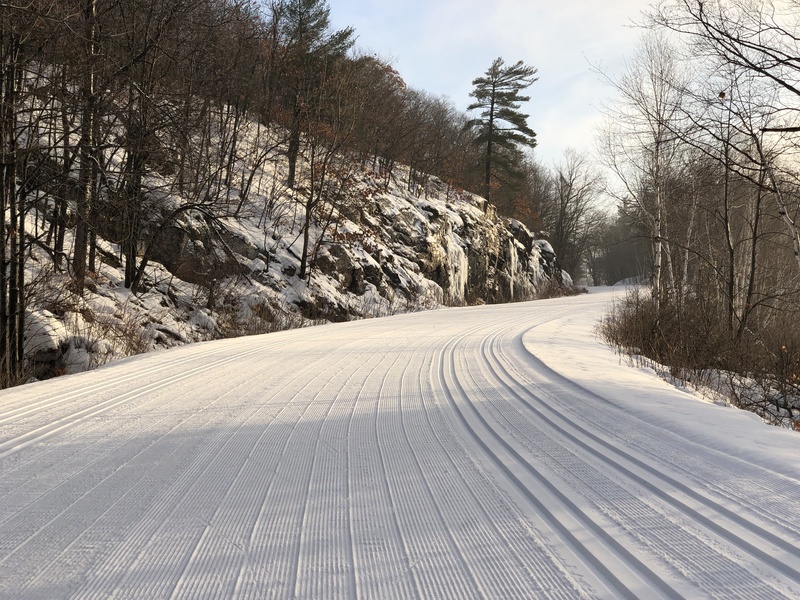 Snow is around the corner and xcountry skiing, of whatever kind, is more fun and less arduous than cycling indoors – in my opinion. Okay, that was a great season of cycling, thanks in part to the incredible weather. If you rode with us, many thanks for bringing your joie de vivre each weekend. The sun is within us; let it shine through. One candle lights many. Stinsons 8:00 am 8:00 am – (two minute rule in force) Ride to Neat Cafe or Carp to see Alice, depending upon the wind direction. Total kilometres expected to be on the 70-90 km range. Relaxed pace in comparison to the rides during peak season. Weather will be cool but sunny. Dress accordingly. Hope to see you there.